In terms of water quality, what happens on the land is just as important as what happens in the water. Nonpoint source pollution, or polluted runoff, is thought to be the greatest threat to coastal waters, which is why Congress mandated shared responsibilities for this issue between land use decision makers and water quality agencies. 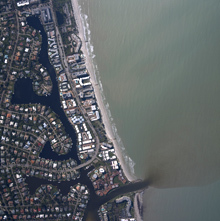 The Coastal Nonpoint Pollution Control Program, which was established in 1990 by Section 6217 of the Coastal Zone Act Reauthorization Amendments, is jointly administered by NOAA and the Environmental Protection Agency (EPA). The goal is to reduce polluted runoff to coastal waters. The program establishes a set of management measures for states to use in controlling runoff from five main sources: agriculture, forestry, urban areas, marinas, and hydromodification (shoreline and stream channel modification). The program also includes management measures for wetlands, riparian and vegetated treatment systems. State authorities ensure implementation. All coastal and Great Lakes states and territories that participate in the National Coastal Zone Management Program are required to develop coastal nonpoint pollution control programs. Some of the land use practices recommended to reduce runoff include preserving natural vegetation, avoiding development within sensitive habitats and erosion-prone areas, and limiting impervious surfaces such as pavement, decking, and roof tops as much as possible. NOAA and EPA review coastal nonpoint programs. All states were initially approved, with conditions (see “conditional approval findings” under each state link below). States receive full approval for their programs after they satisfy all conditions (see “full approval decision memo” under each state link). Note: If a state or territory does not have an active link to its full approval decision document, it has yet to receive full approval.